By: Barkley, Elizabeth F .
Contributor(s): Major, Claire Howell [author.] . Machine generated contents note: Preface Acknowledgments Introduction: Conceptual FrameworkHow Can We Best Teach to Promote Learning? What Is a Learning Assessment Technique (LAT)? How Do LATs Support the Kind of Teaching that Promotes Significant Learning? Part One: The Learning Assessment Techniques Cycle 1 Step One: Clarifying What You Want Students to Learn Defining Learning Aiming for Significant Learning Using the Learning Goals Inventory (LGI) to Identify Significant Learning Goals Expressing What You Want Students to Learn in Language that Is Helpful for Assessment Identifying Course-Level Goals Considering the Challenges Related to Course Learning Objectives and Outcomes Determining Course-Level Learning Objectives Identifying Course-Level Student Learning Outcomes (SLOs) Differentiating Between Learning Objectives and Learning Outcomes Crafting a Course Learning Outcome Statement Determining Performance Criteria and Standards for Individuals and the Class as a Whole Is All the Work Required Worth the Effort? 2 Step Two: Determining Your Purpose for Assessing Learning Defining Assessment How Learning Assessment Is Different from Grading Types of Learning Assessment Assessing Students to Determine for Ourselves How Well Students Are Learning Assessing to Give Learners Feedback on Their Progress Assessing to Improve Our Profession Through the Scholarship of Teaching and Learning (SoTL) Assessing to Provide Information to Institutional and External Stakeholders on How Well Students Are Learning Crafting the Assessment Question 3 Step Three: Selecting a LAT Using the Learning Goals Inventory (LGI) Considering Instructional Context When Choosing a LAT Key Instructional Elements to Consider Considering Clustering LATs Together 4 Step Four: Implementing the Learning Activities and Collecting the Learning ArtifactsCreating Assessment Rubrics Creating Student Self-Evaluation Forms Creating Peer Evaluation Forms Introducing the Activity Providing Students with Information They Need About the Learning Assessment Facilitating the Learning Assessment Concluding the Activity Timing the Phases Collecting the Learning Artifacts Managing the Learning Artifacts 5 Analyzing and Reporting What Students Have LearnedIdentifying Whose Learning You Are Gauging Considering Independent and Collaborative Data Analysis Scoring Individual Learning Artifacts Scoring Group Artifacts Determining the Method of Data Analysis Using Quantitative Data Analysis Using Qualitative Data Analysis Displaying the DataInterpreting the Results Writing Up the Results of the Assessment 6 Closing the LoopModifying Your Learning Goals, Objectives, and Outcomes Adjusting Your Purpose for Assessing Learning Selecting a Different LAT Altering an Aspect of Implementation Changing the Way You Analyze or Report Findings Part Two: Learning Assessment Techniques 7 Teaching and Assessing for Foundational Knowledge Clarifying Learning Goals Related to Foundational Knowledge Identifying Learning Outcomes for Foundational Knowledge Aligning Course Level Foundational Knowledge Learning Outcomes with Institutional Learning Goals Assessing Achievement of Foundational Knowledge Learning Outcomes Foundational Knowledge Domain LATs 8 Teaching and Assessing for Application Clarifying Learning Goals Related to Application Learning Identifying Learning Outcomes for Application Learning Aligning Course Level Application Learning Outcomes with Institutional Learning Goals Assessing Achievement of Application Learning Outcomes Application Domain LATs 9 Teaching and Assessing for the Integration Domain Clarifying Learning Goals Related to the Integration Domain Identifying Learning Outcomes for Integration Learning Aligning Course Level Integration Learning Outcomes with Institutional Learning Goals Assessing Achievement of Learning in the Integration Domain Integration Domain LATs 10 Teaching and Assessing for the Human Dimension Domain Clarifying Learning Goals Related to the Human Dimension Domain Identifying Learning Outcomes for Human Dimension Learning Aligning Course Level Human Dimension Learning Outcomes with Institutional Learning Goals Assessing Achievement of Learning Regarding the Human Dimension Domain Human Dimension Domain LATs 11 Teaching and Assessing for the Caring Domain Clarifying Learning Goals Related to the Caring Domain Identifying Learning Outcomes for Caring Domain Aligning Learning Outcomes Related to Caring with Institutional Learning Goals Assessing Achievement of Learning Outcomes in the Domain of Caring Caring Domain LATs 12 Teaching and Assessing for the Learning How to Learn Domain Clarifying Learning Goals Related to the Learning How to Learn Domain Identifying Learning Outcomes for the Learning How to Learn Domain Aligning Learning Outcomes Related to Learning How to Learn with Institutional Learning GoalsAssessing Achievement of Learning Outcomes in the Domain of Learning How to LearnLearning How to Learn Domain LATs Appendices . Summary: "50 Techniques for Engaging Students and Assessing Learning in College Courses Do you want to: Know what and how well your students are learning? Promote active learning in ways that readily integrate assessment? Gather information that can help make grading more systematic and streamlined? Efficiently collect solid learning outcomes data for institutional assessment? Provide evidence of your teaching effectiveness for promotion and tenure review? Learning Assessment Techniques provides 50 easy-to-implement active learning techniques that gauge student learning across academic disciplines and learning environments. Using Fink's Taxonomy of Significant Learning as its organizational framework, it embeds assessment within active learning activities. Each technique features: purpose and use, key learning goals, step-by-step implementation, online adaptation, analysis and reporting, concrete examples in both on-site and online environments, and key references--all in an easy-to-follow format. The book includes an all-new Learning Goals Inventory, as well as more than 35 customizable assessment rubrics, to help teachers determine significant learning goals and appropriate techniques. This book also provides access to a downloadable worksheet to guide teachers through the seven steps of the Learning Assessment Techniques planning and implementation cycle. College teachers today are under increased pressure to teach effectively and provide evidence of what, and how well, students are learning. An invaluable asset for college teachers of any subject, Learning Assessment Techniques provides a practical framework for seamlessly integrating teaching, learning, and assessment"-- Provided by publisher.Summary: "The book includes an all-new Learning Goals Inventory to help you determine significant learning goals and identify the appropriate techniques to help students achieve these goals, as well as a downloadable worksheet to guide teachers through the seven steps of the Learning Assessment Techniques planning and implementation cycle and more than 35 customizable assessment rubrics. College teachers today are under increased pressure to teach effectively and to provide evidence of both what and how well students are learning. Learning Assessment Techniques is an invaluable toolbox for college teachers in any subject and provides a practical framework for seamlessly integrating teaching, learning, and assessment"-- Provided by publisher. "50 Techniques for Engaging Students and Assessing Learning in College Courses Do you want to: Know what and how well your students are learning? Promote active learning in ways that readily integrate assessment? Gather information that can help make grading more systematic and streamlined? Efficiently collect solid learning outcomes data for institutional assessment? Provide evidence of your teaching effectiveness for promotion and tenure review? Learning Assessment Techniques provides 50 easy-to-implement active learning techniques that gauge student learning across academic disciplines and learning environments. Using Fink's Taxonomy of Significant Learning as its organizational framework, it embeds assessment within active learning activities. Each technique features: purpose and use, key learning goals, step-by-step implementation, online adaptation, analysis and reporting, concrete examples in both on-site and online environments, and key references--all in an easy-to-follow format. The book includes an all-new Learning Goals Inventory, as well as more than 35 customizable assessment rubrics, to help teachers determine significant learning goals and appropriate techniques. This book also provides access to a downloadable worksheet to guide teachers through the seven steps of the Learning Assessment Techniques planning and implementation cycle. College teachers today are under increased pressure to teach effectively and provide evidence of what, and how well, students are learning. An invaluable asset for college teachers of any subject, Learning Assessment Techniques provides a practical framework for seamlessly integrating teaching, learning, and assessment"-- Provided by publisher. "The book includes an all-new Learning Goals Inventory to help you determine significant learning goals and identify the appropriate techniques to help students achieve these goals, as well as a downloadable worksheet to guide teachers through the seven steps of the Learning Assessment Techniques planning and implementation cycle and more than 35 customizable assessment rubrics. College teachers today are under increased pressure to teach effectively and to provide evidence of both what and how well students are learning. 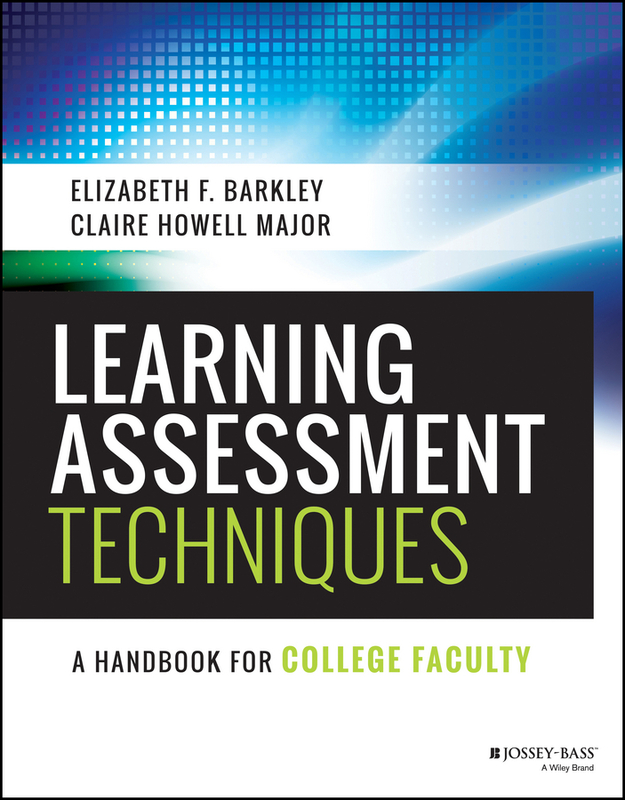 Learning Assessment Techniques is an invaluable toolbox for college teachers in any subject and provides a practical framework for seamlessly integrating teaching, learning, and assessment"-- Provided by publisher.